Large area sprinkler heads include water oscillators or oscillating sprinklers, that can cover areas up to 3,600 square feet. Oscillating sprinkler heads have nozzles that spray water in a uniform manner across your lawn and oscillate similar to a fan motion. Other large area sprinklers - though they do not cover as large an area as water oscillators - are impact sprinkler heads. Impact heads water areas up to 90 feet in diameter. The impact arm can be adjusted to spray a full 360 degrees or less. Most impact sprinklers have deflector shields so they can be placed along sidewalks or driveways without watering the cement or spraying water in unwanted areas. For medium-sized lawn areas, gear drive sprinklers are great. They water areas up to 65 feet in diameter and have a quiet and smooth rotation. Gear driven rotor sprinklers are ideal because many of them have adjustable spraying patterns that can be customized to your lawn's specific needs. Also good for medium yard areas are cyclone sprinklers. 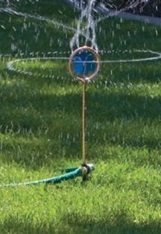 With area coverage of up to 40 feet, cyclone sprinkler heads spray in an upward pattern. Cyclone sprinklers are also known as rotary or spinning sprinklers. Rotary sprinkler heads spin in a circular motion to provide a uniform spray. 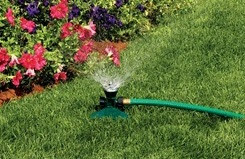 For smaller areas like gardens and shrub or tree areas, there are soaker irrigator sprinklers and shrub sprinkler heads. These are also called mushroom bubblers. They provide more of a soak or trickle than an actual spray. They are ideal for watering delicate plants and flowers.While many hose-connected water sprinklers have an adjustable spray, there are some that have a fixed spray. Fixed spray sprinklers water at a fixed distance and come in patterns such as ring, circular, square and rectangular spray patterns. Another garden sprinkler option you may consider are ornamental sprinklers. These add a decorative element while providing much needed water to your lawn and garden areas. Choosing lawn sprinklers is important. You need to have the correct types of sprinkler heads in certain areas so plants and flowers are not damaged and so your yard receives the correct amount of water. Do your research on yard sprinklers so you make the right decisions for your yard's watering needs.